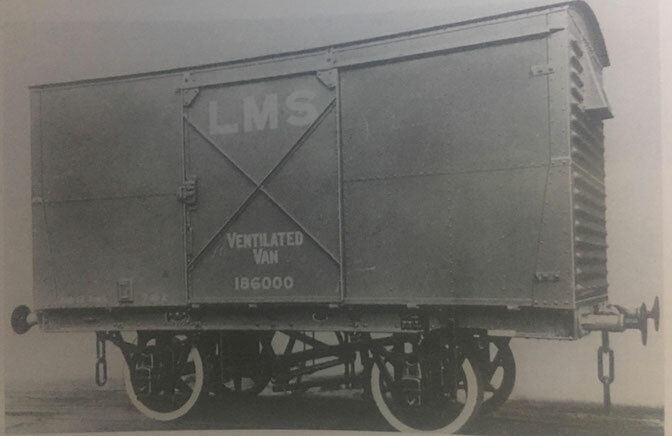 The LMS 12 Ton ventilated goods van, Diagram No. D1828/D1829 were built between 1929 and 1930 by a number of different builders and manufactures including the Gloucester Railway Carriage and Wagon Company Limited and Metro Cammell/Metropolitan Carriage and Wagon for use by the London Midland and Scottish Railway Company. Out of a total of 1000 originally built only approx. 32 similar goods vans have made it into the present day mostly being used on farms and in fields for storage and use as garden sheds, most of these were taken off of there wheels and sometimes chassis and placed directly onto the ground (grounded). Since then, a large number of these remaining vans have deteriorated and either rusted away or have now been scrapped but a small number still do survive still in the fields and farms and still grounded but two examples are still in existence still on their chassis and wheels these are LMSR 179162 by Metro Cammell/Metropolitan Carriage and Wagon in 1929 and based at Washford, Somerset and Dorset Railway Trust and the other example being Gloucester Railway Carriage and Wagon Built M 187085 built 1930 which was purchased privately and gifted to the Gloucester Railway Carriage and Wagon Museum on long term permanent Loan. Further information on M 187085 can be found below. M 187085 (other numbers: 187085, KDM 187085, I/U 024531) was one of 300 built to diagram D1828/D1829 by the Gloucester Railway Carriage and Wagon Company Limited in 1930 being allocated Lot No. 485. M 187085 and one other built to the same diagram and lot number by the Gloucester Railway Carriage and Wagon Company Limited made it into the present day but sadly has since either rotted away or been scrapped and therefore M 187085 is the sole surviving member of the Gloucester Railway Carriage and Wagon built LMS Goods Van of this Diagram no. and Lot No. We as a community are lucky to have an example of both build years surviving and in preservation one being the 1929 built Metro Cammell/Metropolitan Carriage and Wagon 179162 and 1930 built Gloucester Railway Carriage and Wagon Company Limited 187085. Although we do not know the exact colour scheme we can look at other examples of this wagon that have been created in model form and others that are very similar built for the London Midland and Scottish Railway Company around the same time and to which the colour was a Standard LMS Wagon Grey with Black running and brake gear possibly with white rim wheels, LMS Lettering in white with the wording 'LMS' on the upper door panel, 'Ventilated Van' on the lower door panel also in white and further wording and writing including 'TARE' weight and wagon number. 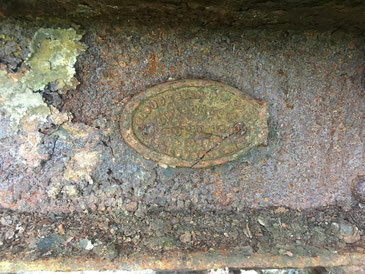 This wagon would also have the builders plate which can still be seen today and a photograph of which can be seen further down this page and a gently repaired plate which can also be seen further down and both are still intact and are still on the outer sole bar of this Van. During the Nationalisation of the Railways by British Railways (later British Rail) in 1948, some wagons and vans changed usage while others stayed the same but painted in different liveries and styles and many of these LMS Ventilated Vans had their colours changed to a Bauxite Livery as well as a white/grey livery. We are not sure what liveries M 187085 carried other than LMS Grey but we are currently researching this but from the photographs we have of the van during its preservation we can see/tell that it did carry a white livery at some stage during its life. 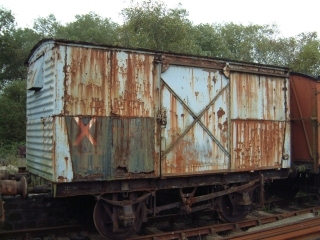 During the British Railway period a number of wagons were given what is known as a TOPS code and this LMS Van was given the TOPS code of ZRO, which meant Stores Vehicle. M 187085 was purchased by the Southern Catering Project Group (SCPG) in February 1999 and arrived on the Avon Valley Railway that same month; in 2005 it was moved to the Swanage Railway. During its period being owned by the SCPG, M 187085 was loaned to a preserved railway to undergo full restoration during which M 187085 was never restored but was used to store road salt of which some of the bags were open and/or damaged and the salt has sadly made the van worse that it was when it was purchased by the SCPG initially and has corroded some of the metalwork on this wagon and this wagon therefore needs a lot of restoration work done to it to make it fully operational once again. 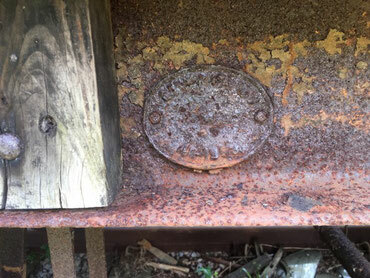 Once the SCPG found out that the van had not been restored and was used to store road salt it was immediately returned to them and has spent the remainder of its preservation life sitting in a siding under trees and overgrown rails like many items of rolling stock on preserved railway and heritage rail related sites awaiting restoration and a brighter future. In 2016-2017 we the Gloucester Railway Carriage and Wagon Museum contacted the SCPG in regards to Gloucester built rolling stock they have/had in their collection of which M 187085 being one of them. 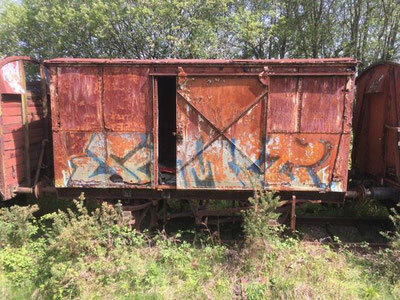 In late 2017 we tried to raise the funds for the purchase of a Gloucester Bogie and were approached by Avonside Engineering Services Limited who were interested in purchasing the Bogie on our behalf but sadly by the time we managed to organise and contact the sellers the Bogie was cut up for scrap but both parties agreed to keep in touch if there wasy anything else could be done at a later date. In April - May 2018, we the Gloucester Railway Carriage and Wagon Museum were approached by the SCPG this time regarding M 187085 and were asked if we were still interested in the restoration of M 187085 and we were given the opportunity to purchase the Goods Van, we then started thinking of a way in which we could raise the funds to purchase the goods van as we forgot Avonside Engineering Services Limited offered to purchase the bogies and mentioned to be kept updated, so the founders of the museum sent a message to the Director and had a rather lengthy discussion about the wagon. We then have a site visit at Swanage Railway between May and the June to inspect the Goods Van. The site visit going well, on our return we stopped of for a refreshment break at the services and sat down around the table discussing the wagon, possible transportation methods, restoration and possible and potential usage for the wagon, if we were to agree to purchase it. The following day an email was set to the SCPG to agree to purchase the wagon and the party purchasing it on our behalf, the transaction was then completed by the 21 June 2018 and has since been in the ownership of Avonside Engineering Services Limited and on long term permanent loan to ourselves. We are currently in the process of arranging transportation and a new temporary and/or permanent home for the wagon. While in the care of ourselves, M 187085 will undergo a full restoration back to full working order and it is also planned to be utilised by ourselves as a temporary home for the museum and its collection until a more permanent home/building can be found. Once a permanent home is found for the museum and its rolling stock, artefacts and archives then this Goods Van will become available to loan/hire by heritage railways and preservation societies subject to contract, agreement and the necessary arrangements. A Datasheet will full technical details and information and the restoration appeal can be found below. Braking: Morton type brakes with shoes on two wheels on one side only. Morton type brakes with shoes on two wheels on one side only. Alleged to have been built to drawing no. 13/1617 and allocated to D1829 however a number of photographs clearly show that several Gloucester built vans have corrugated ends, so some doubt must be about D1829 and whether any were ever built to that diagram and so diagrams D1828 & D 1829 will be considered together and Gloucester must have combined both diagrams to form this unique goods van. These drawings/diagrams are depicted to have a wood-clad interior with steel-clad exterior. It states in The LMS Wagon by R.J. Essery & K.R. Morgan that "The second Diagram, D1929 was shown as having plain steel ends; only one lot was involved, built by the Gloucester Railway Carriage and Wagon Company. As the photograph of 186000 (at top of this page) shows at least one vehicle of this lot with corrugated ends, the diagram book may be in error here. In both cases single hood type ventilators were fitted to each end, no roof ventilation being provided.... The corrugated steel ends proved very successful...."
Purchased by the Southern Catering Project Group (SCPG) in February 1999 from Jarvis Facilities (Jarvis Internal Number: 024531) at Hoole Yard, Chester, initially transported to Yeovil Junction and later moved to Avon Valley Railway for use with only surviving Midland Railway 1377 class 1F 0-6-0T Locomotive 41708 in the same year. In 2005 moved to Swanage Railway, SCPG loaned vehicle to heritage railway to restore but was never done, instead was used to carry road salt , returned back to Swanage Railway and stored ever since. Purchased by Avonbank Engineering Services Limited in June-July 2018 on behalf of the Gloucester Railway Carriage and Wagon Museum and is long long term permanent loan to the Museum. 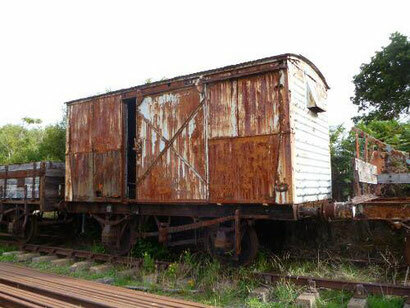 Gloucester Railway Carriage and Wagon Museum plan to fully restore this vehicle to operational condition as well as for the purpose of housing the Museum's current collection of GRC&W Artefacts. WHAT IS THE M 187085 RESTORATION APPEAL? As a relatively new currently unregistered museum we need all the help we can get to get us off the ground and this includes volunteers, funds/donations and much more.. the restoration of the Museum's first item of railway rolling stock will and has taken priority since 18 November 2018. This vehicle was gifted to the Museum on a long term permanent loan basis, the railway rolling stock in question is London Midland and Scottish Railway Ventilated Goods Van built in 1930 by the Gloucester Railway Carriage and Wagon Company Limited. We know donations and funds is a lot of ask anyone, so we have come up with the M 187085 Restoration Appeal. This M 187085 Restoration Appeal is a way of helping the museum in large way with small amounts of money but also a way to volunteer your services an time to help with the restoration of the Museum's first item of rolling stock. The money raised at the events we attend covers the day-to-day running costs of the Museum such as paper, ink, laminating pouches to enable us to display information in a professional way and keep the information clean and tidy for each and every event to the best of our ability, this does not enable us to pay or cover the huge costs of restoring rolling stock, purchasing or renting land and/or infrastructure. 2 Coupling Chains have already been donated to the Museum to help with the restoration project but are currently awaiting collection. We here at the Gloucester Railway Carriage and Wagon Museum are not asking for anyone to donate a particular sum of money or volunteer time but anything you are able to do to help would be gratefully appreciated and will go into the restoration of this lovely item of rolling stock to bring it back into use and back to its former glory once again carrying its original LMS Wagon Grey livery with full lettering and markings. If you would or could help in any way we would love to hear from you. Please feel free to contact us via email: GRCWM@outlook.com for further information or to offer your services. We look forward to hearing from you. Please help support Gloucester Railway Carriage and Wagon Museum by shopping online. Every time you shop, you’ll raise a free donation for Gloucester Railway Carriage and Wagon Museum every time, it’s that easy!